Casa Zim is a self-catering holiday house in Xai Xai. Rates from R230.00 per person. Situated in the Chongoene Holiday Resort. Casa Zim is a privately owned self-catering holiday house situated in the Chongoene Resort in Xai Xai. Xai Xai is a popular holiday destination, situated approximately 235km North of Maputo. Holiday makers enjoy the sparkling warm ocean, the pristine beaches and the excellent fishing and snorkelling. 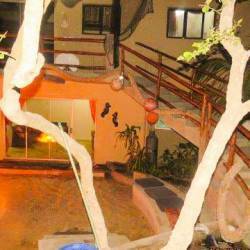 Casa Zim is a double-storey 4 bedroom house which can accommodate 8 people. Two of the bedrooms are situated upstairs and two are downstairs. The house has 2 bathrooms and an open plan kitchen/lounge area which leads out onto a large deck with incredible sea views and meltingly beautiful sunsets. The on-site restaurant and bar is situated on the beach front and provides an assortment of delicious, fresh meals and ice cold beverages. We had a great time. Thank you. Chongoene is a lovely relaxing place, Casa Zim although nice, had some issues which needs to be addressed. No microwave, tv broken, air-con not working in upstairs left hand side room. Best note that this is 2 separate units as bookings with kids does not make the split ideal and they have separate entrances. We were very happy and satisfied. Chongoene is heaven on earth. Peaceful and beautiful.